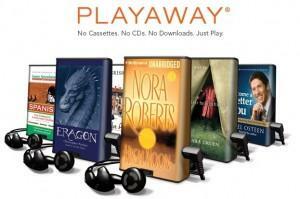 Half the size of a deck of cards, Playaway is the simplest way to listen to a book on the go and, with no tapes or CDs. With every title recorded in HD Audio, Playaway’s audio quality is unsurpassed. Using clearly marked buttons, Playaway gives listeners the ability to move back and forth within or between chapters and alter the speed of a narrator’s voice. It even has an automatic bookmark feature that remembers where you left off. Additionally, Playaway has a universal headphone jack that works with almost any type of headphone or mobility accessory. If you don’t own headphones, you can purchase a set at the library. Playaways can be checked out for 3 weeks at a time. Look for the new Playaways near the audiobooks on CD.